Precision EquiDerm is a revolutionary new wound gel- The combination of Benzalkonium Chloride and Natural Egg Membrane not only kills 99.9% of bacterial and fungus but increases the regrowth in healthy tissue at an amazing rate! 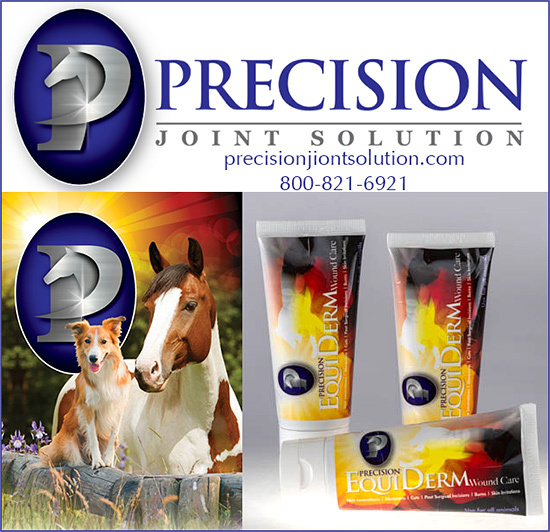 Precision Joint Solution knows that spring time means horse shows, shedding, clippers and mud. If you are like the majority of horse owners, you have suffered the wrath of mud fever or equine scratches more than once. If you are lucky, you have no idea what scratches are and how they might ruin you (and your horses) day. If you aren’t familiar, equine scratches or Mud fever are a bacterial infection that affect the horses leg, specifically the pastern area. This condition causes chapping, chaffing cracking and crusting (Fun right?) Horses that are bathed and clipped often are more prone to scratches because the area is constantly damp and the bacteria has the perfect environment to thrive. Scratches are fairly easy to spot while picking your horses feet, but in the past have proven to be especially difficult to treat. Scratches and Mud Fever In Horses Can Really Be Hard To Beat… Until Now! Precision EquiDerm is extremely successful with alleviating equine scratches! If your horse has scratches, follow our protocol and you should see a difference in a matter of days! Read on to learn how Precision riders are clearing this pesky ailment! Step 1. Purchase a tube of Precision EquiDerm. Step 2. Wash your horses legs and give them a gentle scrubbing. Let them dry completely. Step 3. Cover the entire affected leg in Precision EquiDerm Wound Gel. We recommend applying a light leg wrap but this is not required. Change the wrap or if left unwrapped, re apply the EquiDerm 24 hours later. Most of our clients report a noticeable difference by day three! If your horse has bad scratches, we would love for you to take pictures and send them to us with before and after results. What Are The Ingredients In EquiDerm? Is It True That A Clinical Study Shows Healthy Tissue Growth With EquiDerm? Yes! A clinical study showed 75% of wounds demonstrated visible granulated tissue after just one week of daily use. How Can Egg Membrane in EquiDerm Help My Dogs? Note: Nothing works better to eliminate 99.99% of all viral, fungal and bacterial pathogens while preventing future infections than Benzalkonium Chloride. Together these two ingredients create one of the best wound gels on the market today! Note: Precision EquiDerm Wound Gel is the first animal wound product to combine skin healing elements of egg membrane protein with the antimicrobial capacity of Benzalkonium Chloride. What Do Dog Owners Say About EquiDerm? Precision Equiderm is great on hard-to-heal wounds. It reduced necrotic tissue and healed a very infected puncture wound in half the time I could have healed it with other products I have tried. It really reduced the scar tissue and healed flat, very little noticeable scar. Amazing stuff! At Only $29.99 Why Wouldn’t You Have The Best For Your Dog or Horse? Of course we have bulk discounts! When you see and experience the EquiDerm DIFFERENCE, you’ll never go back! EquiDerm is simply the best wound cream on the market today. Order now to have it in your tack box— before you need it— and never be without it!